We had the pleasure of having Tosca join us on this episode of LD&K. In between ramblings by the hosts we got to hear how much Tosca loves car chases. And fashion. A donkey race may have been spoken of as well. Believe it or not, that all ties in to her latest book Progeny, due to drop in stores on May 24th! Stick through the whole thing to hear Tosca's views on naming favorite authors - and to get some good Audible recommendations! We discuss Tosca's hidden love of fashion, her past as a gamer, and how Biblical fiction doesn't have car chases. There is some 'fun' discussion about Count & Countess Bathoroy and their torture techniques. Liberty and Tosca come to an agreement on who the best Star Trek Captain is. Supernatural gifts, demons, and martial arts - oh my! In our two segments with Amy Brock McNew, Aaron manages to break Amy before we barely even get started. Which is totally epic. We are Josh-less in this part! The myriad of places that Amy's notes end up during her plotsing process. Her crazy Scrivener/note card hybrid organizing process. Paydays, yellow Starbursts, Jelly Bellies, and all the other goodies in Amy's desk. Vampiric blood (you have to listen to hear how this figures in). How Pinterest figures in to her relating to her readers. How her background in journalism led to her being surprised by the author culture. Where her heart is and what she wants to do in the future where that is concerned. Why Amy wrote REBIRTH, which sounds a lot like many other authors' reasons for writing their books. The cathartic background of REBIRTH for Amy. Amy teases the sequel, RECONCILIATION, in her description of her favorite character in the book. (There's popcorn involved!) And it makes all of us want to read Rebirth. Some of the freaky things that Amy ran across in the course of research, and how off so much of it was. 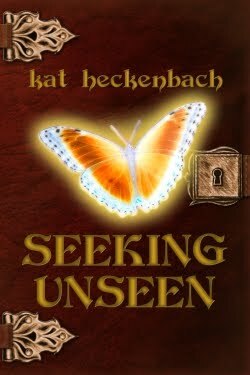 We were delighted to have Kat Heckenbach on the podcast this week! 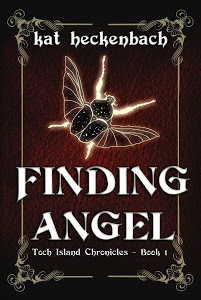 Kat is the author of Finding Angel & Seeking Unseen, both entries in the Toch Island Chronicles. With origins in biology, math, and art, her journey to become an author took a bit of circuitous route. With Kat’s background in biology, she shares how that informs the Toch Island Chronicles. The flora and fauna are very important details in her books! The Lord of the Rings is also discussed and how it figures into Kat’s favorite character in her books. There’s magically-powered electric guitars involved! (This, I gotta see!) With the biology background, it really feeds into how adamant Kat is about the setting of her books. I can’t recall if we’ve seen any of our guests so far be so firm about a story location! Reasons for writing fantasy abound, and there be sheep involved! And as we get into Kat’s answer to our superhero question, Aaron brings up some trivia about the making of The Avengers. As we shift into writing mode, we of course ask our plotting versus pantsing question. Kat’s answer involves a lot of notecards. Can you guess her answer? Because Aaron has an irreverent solution to her notecard “problem.” About that point in the show, we start plotting against Aaron’s neighbor’s tree….which continues to cause connectivity issues for the podcast. Getting back on track (is this a possibility with this bunch? ), we talk about a lack of snacks and drinks with Kat and why that is. We hates research, Precious! That is why we writes fantasy! Every writer’s favorite part of the episode: Kat offers some of her favorite tips for marketing, and some are pretty off beat options, but definitely viable for most every author. Even though Kat’s is a well-known Harry Potter fan, her answer to our new fandom question may surprise you. But her favorite book is the Harry Potter series. Can you guess which one? And as we wrap things up with Kat for this time, her most surprising thing about being a writer may just surprise you as well. This and a whole lot more—with lots of laughing!—in this week’s episode.